Having the honor of groundbreaking for the SCC Veterans Memorial are from left: General Contractor Adam Stein of Stein Corporation; Architect Mark Johnson of Dykes-Johnson; SCC CA President John Luper; SCC Veterans Memorial Committee Chairman Walt Cawein; and Five-Star donor Dallas Tuthill. 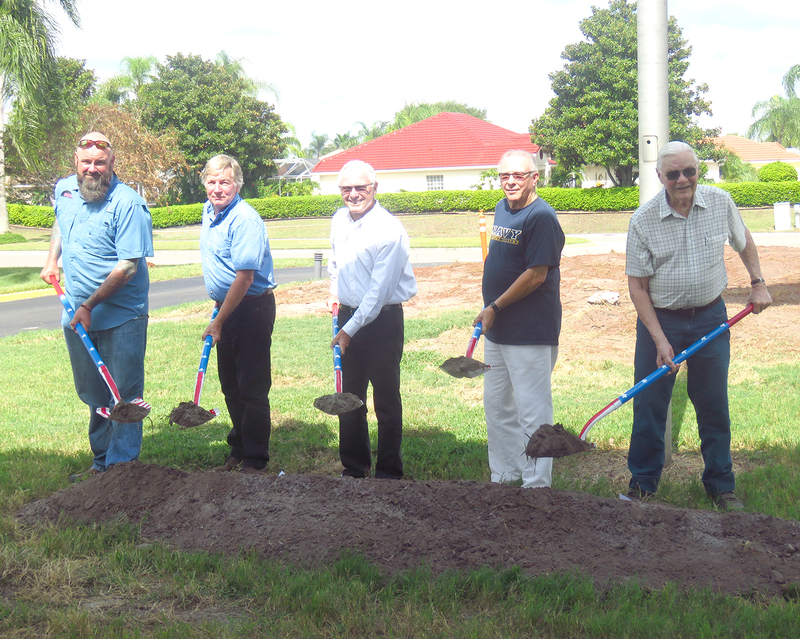 Members of the Sun City Center Veterans Memorial Committee were all smiles at the July 17 groundbreaking. About 175 from the community were on hand to hear a description of the memorial and a big thank you to the many individuals, clubs and organizations who were supporting it. The day’s program, emceed by Bill Hodges, included the National Anthem led by April Kerbow, Pledge of Allegiance led by James Haney, Invocation by Rev. Julian Graham of United Methodist Church of Sun City Center and remarks by Memorial Committee Chairman/SCC Charitable Foundation President Walt Cawein. In his remarks, Cawein said that work started a year ago when the Sun City Center Charitable Foundation Board of Directors discussed sponsoring this long overdue project. Currently there are only two memorials in the SCC community. They honor First Responders. The foundation directors enthusiastically supported the idea of promoting civic pride with a tribute to former, current and future SCC family veterans who have served in the U.S. military—Army, Marines, Navy, Air Force, Coast Guard and World War II Merchant Marines. 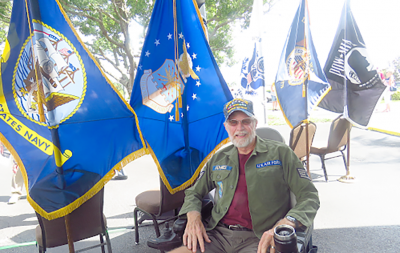 The next steps were to create a Veterans Memorial Committee to involve community leaders and representatives from the local military organizations, determine a site and start raising funds. The memorial’s site in front of the SCC Community Hall, 1910 S. Pebble Beach Blvd., was chosen for its high visibility and easy, safe accessibility. The memorial will fill the area inside the circular driveway and be accessed via an 8-foot-wide walkway. Included in the space will be a U.S. flag, a State of Florida flag and each of the five military service flags, a 6-foot eagle mounted on black granite, a sculpture of a Belgian Malinois war dog named Warlock and benches. The foundation will be 8,000 brick pavers, many engraved with names of veterans and area individuals and organizations that are supporting the project. The Veterans Memorial groundbreaking was on July 17 at the SCC Community Hall. Many veterans donned hats and shirts displaying service-related insignias. Mike Boynes proudly wore a jacket from his Air Force days in the ’60s. Cawein said the cost of the project is being determined as they finalize design and construction details, but they know they still have a way to go. Sales of about 400 bricks and donations total $140,000 to date. Donations are being recognized as follows: Five-Star ($15,000 and up) Four-Star ($10,000 – $14,999.99); Three-Star ($5,000 to $9,999.99); Two-Star ($1,000 to $4,999.99); and One Star (up to $999.99). This is an ongoing project, so as bricks are sold after the memorial’s completion in November, they will replace blank bricks in the foundation. Asked who can buy a brick, Cawein said that they don’t want to be too restrictive, but generally bricks naming individual veterans can be purchased by—or for—any SCC Community Association, Kings Point or Freedom Plaza resident (past or present). Members of the local military organizations, regardless of where they live, can also buy veteran-specific bricks. The bricks not naming specific veterans can be purchased by any individual or group as long as they in some way honor veterans. Two sizes are available — 4 by 8 inches ($100) and 8 by 8 inches ($200 or $215 with service symbol). Donations can be made, or a brick order form obtained by visiting the foundation’s website at www.charitablefoundationscc.org. Order forms are also available at the SCC Area Chamber of Commerce, the CA Library and many community events. Cawein invites anyone needing more information to call him at 813-340-0533 or send an email to waltcawein@gmail.com.